Get the facts about airplane turbulence before you fly. Our mission at Holiday Extras is to help you travel better, and since we know that airplane turbulence can be the bane of some jetsetters' lives, we wanted to get to the bottom of it once and for all. In this article, we're going to look at what causes airplane turbulence, if it's actually a danger to you, what pilots do to combat it and how you can look to reduce the effects of airplane turbulence for yourself, with the sole intent of arriving at your dream holiday destination in one piece. For more ways that Holiday Extras can help you travel better, read up on tips for fear of flying and how to sleep on a plane, or watch our How to Fly Like a Pro video. 1. What is airplane turbulence? Turbulence is a sudden shift in airflow, which leads to those familiar bumps and shakes on your flight. Light turbulence on a plane is incredibly common, with little or no effect on you and the other passengers. At the very most it will feel like a bump on a road or the usual chug of a train as the plane moves up or down by less than a metre in the air. Moderate turbulence is similar to light turbulence, only the bump in the road is more of a small pothole and it's a particularly windy day on that train track, with the plane deviating by 3  6 metres. Your main concern should be keeping an eye on that beverage in case it spills. During severe turbulence, expect the plane to shift up to 30 metres in altitude. By this point, the pilot would have engaged the seatbelt light to prevent passengers being jolted out of their seats. This is very rare and only lasts a few minutes. 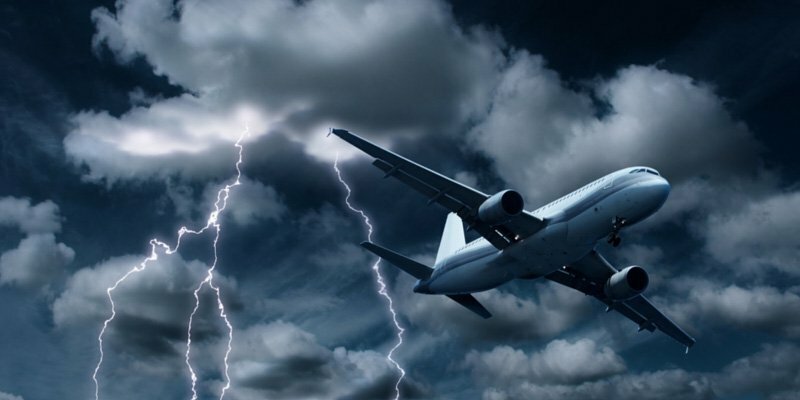 Extreme turbulence on a plane is incredibly rare, and even the most seasoned pilot would probably clock no more than a mere few minutes of extreme turbulence in their entire career. In fact, it's so rare that most pilots have never experienced it, unless during their training: You're in very capable and safe hands. 2. What causes airplane turbulence? This is the effect of the plane flying over a current of fast-moving air into a slower-moving air stream. This type of turbulence is a little trickier to predict but is the most common and little cause for concern. Wake turbulence is caused by the tight, circular tornadoes of air (wingtip vortices) trailing behind a plane, which you'll most likely feel during take-off or landing. Airplane turbulence is the single most common cause of injury to passengers during flights; the US Federal Aviation Administration reports around 60 cases every year. All of those flights land safely. Then, take into account that millions of passengers fly every day and these 60 cases in a year are very, very, very small in the grand scheme of things. Turbulence-related accidents are not life-threatening, occur at 30,000+ feet and in most cases, the injured parties have been flight attendants or passengers out of their seats, or not wearing seat belts. The reality is that turbulence on a plane feels worse than it is. You'll hear scary stories about severe turbulence, but in both reality and statistically speaking, your drive to the airport will be more dangerous (and if you're stuck on the M23 at rush hour, a lot more stressful). Modern aircraft are built to withstand pretty serious turbulence and after a severe experience, the plane will be thoroughly checked as a precaution. Damage is rare. Remember: A plane cannot be turned upside down by turbulence. Though, it would be super-fun if it did. Much like traffic and potholes when you drive a car, pilots deal with turbulence as an everyday occurrence. The only difference is that your pilot will have the benefit of millions of pounds worth of technology and constant communication with air traffic controllers, who relay information about that pesky clear air turbulence we mentioned earlier. Air traffic controllers schedule flights to account for wake turbulence, but it can still happen occasionally. As soon as bad turbulence is detected your trusty pilot will adjust their altitude or route accordingly, which is mainly for the benefit of passengers' comfort rather than for safety. Pilots will always try to avoid the discomfort and increased anxiety that turbulence can cause for passengers. When it can't be avoided, they enforce that helpful little 'fasten your seatbelt' sign. How do you reduce the effects of airplane turbulence? The answer to dealing with airplane turbulence is very simple. Always obey the 'fasten your seatbelt' signs and get into the habit of wearing your seatbelt whenever you are seated. For a bit of added protection, you could try and avoid the back seats of the plane (if you can) as this is where you'll get the bumpiest ride. Sitting over the wings is also thought to provide the smoothest flight, FYI. Now relax, you're in safe hands! Since you now know the facts of airplane turbulence, head to our Before You Go page for more useful tips or the Holiday Extras Travel Blog for trip inspiration.